The morning of Saturday, 23 January, dawned cool and sunny. With happy anticipation, the CCD (Continuing Catholic Development) level 7 Confirmation students and their teachers gathered early at the Parish Centre – it was the day of their 2016 annual Recollection. After a full briefing on the day’s program from the teachers, and a prayer for guidance and a safe journey, the group departed in two busloads from Santuario de San Antonio Parish promptly at 8.00am for the first part of their journey to Antipolo and the Eugenio Lopez Centre, the Recollection venue. For the fifth year in a row, Father Edwin Soliva, SDB, was again the Facilitator and as in previous Recollections, his lecture, his advice, his counselling, his mentoring, his charisma – held the students spell-bound from the beginning to the end of the day’s activities. The Recollection proper started at 9.00am and his opening remarks were “Confirmation is allowing God to bring out the best in you and saying I CAN.” And yet, he continued, of all the seven Sacraments, Confirmation is the most neglected, forgotten, and un-appreciated of all. Therefore, as he told the students, he would teach them and show them how to receive, to respect and to sustain the coming of the Holy Spirit into their lives which would enable them to live their lives each day, to the fullest. Read more….. Warm greetings from the Continuing Catholic Development (CCD) Ministry! As the holiday season is fast approaching, we invite you to be part of a meaningful Christmas by donating to the annual Light a Parol 2015 fundraising project. A parol is a traditional Filipino Christmas ornament, a five pointed star lantern representing the Star of Bethlehem that guided the Three Wise Men on their way to baby Jesus. How can you help? Each Parol that you purchase will represent a gift from you. With your generous donation, we hope to fill the San Antonio Parish Church with parols to welcome our Savior by Christmas Eve. Each parol will carry the donor’s name and hung beautifully in the church complemented by the elegant decor courtesy of Rustan’s Flower Shop. The Light a Parol Donors’ List will be published weekly in the Parish Bulletin. Pledge forms are available at the CCD and parish offices and your donations can be given anytime to the CCD or SSAP parish office. Official receipts will be issued and donations will be accepted until December 23. Now on its 21st year, this project has been the only channel of CCD to raise funds for the Franciscan Missions and various charitable organizations that our young CCD students participate in as well as special projects during different times of the year. Through these outreach programs, the youth are able to demonstrate their faith in action. Please join us for the Light a Parol 2015 official lighting event on Sunday, Nov. 29 during the 6:00PM mass at the Santuario de San Antonio main church. For more information, please contact Leah at (02) 843-8834 or 0917-819-3542, or email ccd.office.ssap@gmail.com. Hoping for your kind support this year. You will surely make a difference in the lives of the less fortunate. 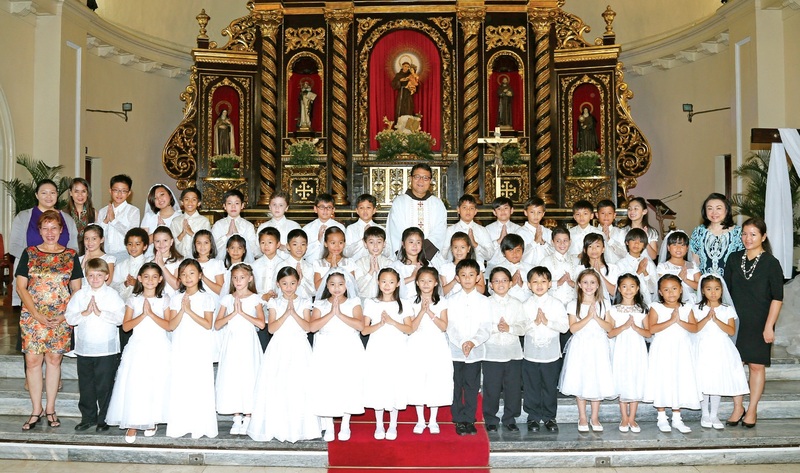 On the Saturday of May 23, 2015, from 8-10 am, the level 7 CCD (Continuing Catholic Development) students (aged 12 – 14) were blessed to receive the Sacrament of Confirmation, for the school year 2014-2015. Continue reading…..